Someone queue the cannabis oompa loompas. A cannabis delivery service is celebrating the legalization of weed in Canada by delivering free munchies to as many people in Toronto as possible on October 17. And on top of the free snacks, the promotion will be even more exciting with a Willy Wonka-style lottery for the first day of legal recreational pot. Cannabis delivery platform Eddy is sponsoring the contest and is inviting potential customers to sign up for the giveaway on its website in order to be added to the list to receive free munchies. Contestants can increase their chances and move up the queue by sharing the promotion on their Instagram account and tagging friends. Those lucky enough to receive free munchies will also be in the running for an extra special prize as “four randomly selected winners will receive a Lucky Green Ticket which will entitle you to a tour of a local weed factory (also known as a licensed producer cultivation facility, but that doesn’t roll off the tongue),” according to the webpage for the promotion. With the legalization of recreational cannabis in Canada this week, companies wishing to compete in the newly legal market will have to employ creative strategies like the Eddy promotion to gain the attention of consumers. But Bill C-45, as the country’s pot legalization measure is known, includes strict restrictions on advertising. The rules prohibit testimonials, celebrity endorsements, brand mascots, and glamorous images. 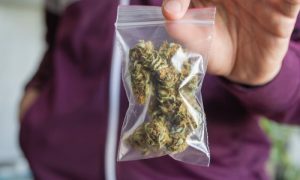 But the laws lack specifics, which is causing confusion for both cannabis businesses and advertising firms, according to Scott Hulbert, the managing director of promotional products company Ideavation. “It’s still really gray,” Hulbert told Canada’s Advertising Specialty Institute. “It’s a moving target, as far as legalities, restrictions and advertising opportunities. Will it be like tobacco, which is very restricted in its advertising, or alcohol, which has been given more of a carte blanche? We just don’t know.” Hulbert said that licensed producers (LPs) will have the expertise necessary to navigate the regulations governing cannabis advertising. Pete Thuss is a marketing partner at Talbot Marketing. He said that while he isn’t currently seeking clients in the cannabis industry, he believes that there will be some opportunities for savvy marketers who are quick to enter the new market.